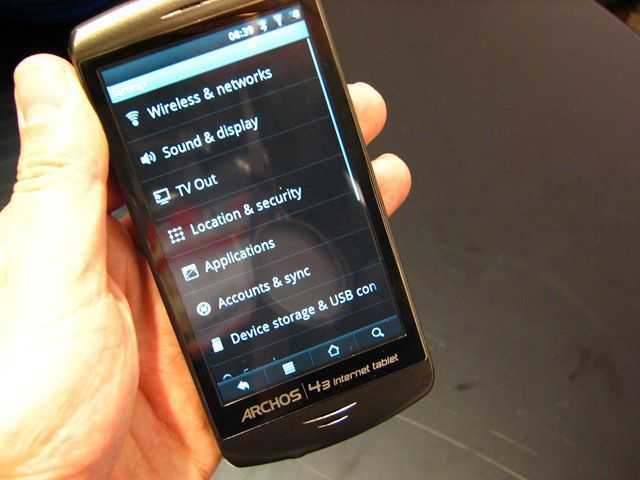 Tag Archive | "archos 43"
I’m nicknaming the Archos 43 the ‘pocket rocket’. Its a great little device that probably shouldn’t be part of the Carrypad product list because its focus is media playback. 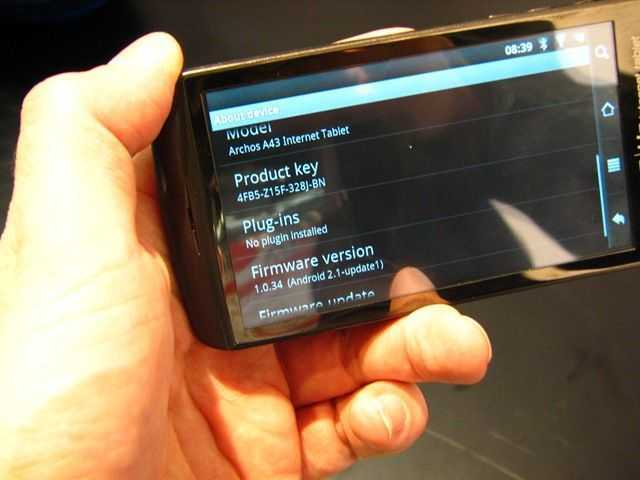 Sure, it runs Android but thinking of the Archos 43 as an Android device would be the wrong thing to do because it conjures up images of contracts, email, calendars and 3G data. The Archos 43 is a $199 PIMP. That’s a Portable Internet and Media Player! Check out the fun 3D gaming test we did. Full specifications, videos, links etc. are shown in our product database. 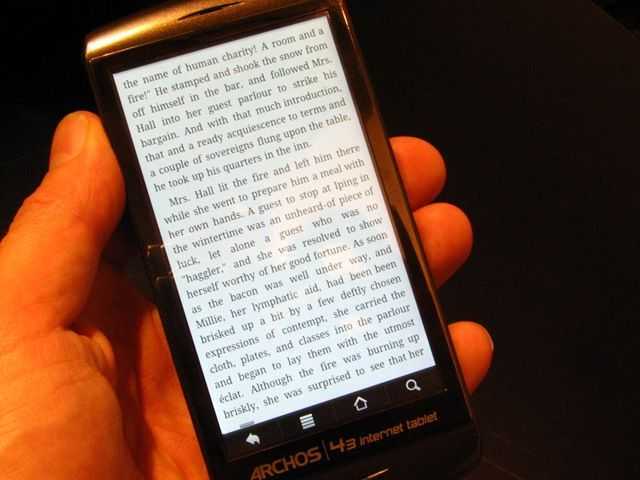 Android brings a comfortable ui and, if you’re able, access to some ‘sideloaded’ applications such as ebook readers and entertainment programs, it grows well to cover some new ground. If you’re thinking of getting an Archos 43 because you want Android though it’s probably the wrong choice. 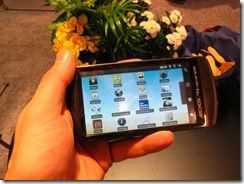 What I like about the Archos 43 is that it is priced so that you can ‘gift’ it to yourself easily and that we’ll see a great community spring up around it. The screen, although resistive, is one of the lightest (touch) I’ve ever used and could be mistaken for a capacitive screen quite easily. The colour and brightness didn’t appear to be as good as the Archos 5 Internet Tablet but it’s not bad either. It’s glossy though. 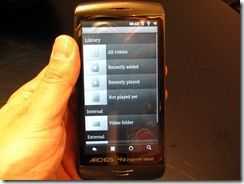 Audio quality from the single speaker is surprisingly good and on par with the Archos 5. I tested the Archos 43 with Android 2.1 which, due to the lack of Cortex optimizations and the lack of JIT compiler, makes the UI less than smooth (the same applies to the 70 and 101) but having experienced the difference between 2.1 and 2.2 on a Cortex core I expect this problem to go away with the promised upgrade. Timescales for the upgrade range from ‘at launch’ to ‘soon after launch.’ Web page load speeds were reasonable on the tested device but again, this will speed up quite a bit with the 2.2 upgrade. There’s some great potential there with the Ti OMAP 3 processing platform running at 1Ghz. It’s missing the PVR capability and dock/remote as found on the Archos 5, multi-touch and the complete Google application suite but it includes USB host (we assume for mass storage and perhaps keyboard and mouse) and an HDMI-out port via an adaptor cable (not supplied in retail packaging.) It also promises ‘720p’ video via 2MP cam. This would need a lot of testing to determine what sort of quality and features are available so I’m not commenting on that here. All in all it’s a great PIMP and a should make an impressive demo when connected to a huge HD screen! Will I buy? No. It’s too close in functionality to the smartphones I’m using and I’m still a little bruised from the early Archos 5 experience I had. 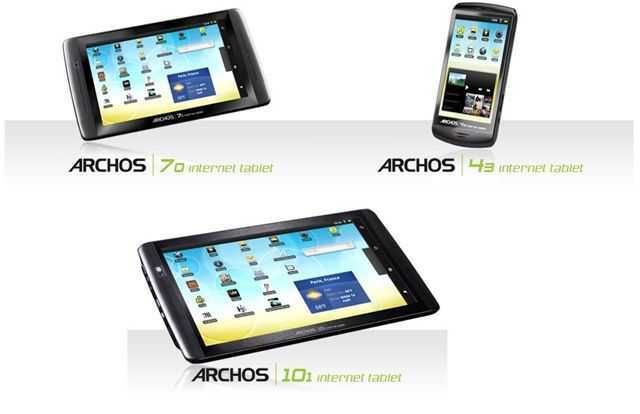 The Archos 70 might be the better gift for someone who already has an Android smartphone. Update: I’m not sure if it features the tethering feature that was useful on the Archos 5. 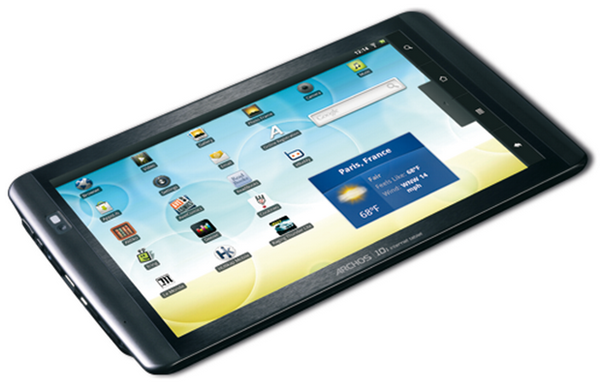 Full specifications are shown in our product database. There are two videos below. The first gives you an overview of the device and the second shows a little detail on the audio player. Archos 43 + Raging Thunder = Fun! I’ve had a lot of hands-on with the Archos 43 [specifications] today and I’m impressed. Somehow that small form factor and low price makes the speed and capability all that more impressive. I’m working on a few other videos but I wanted to show you this one first. Update: Hands-on thoughts, gallery, videos now available. 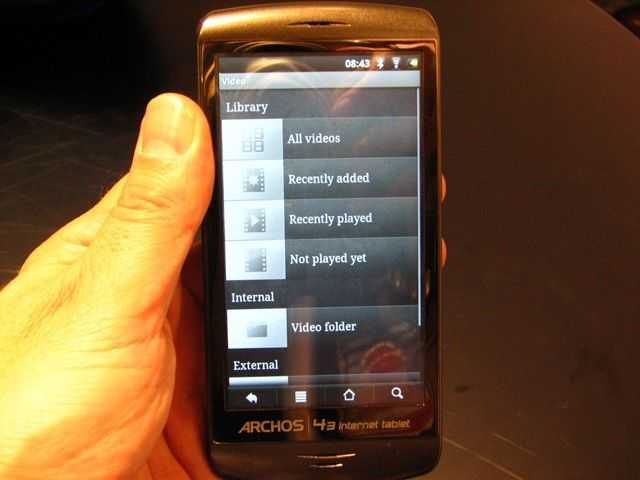 IF (and it’s a big IF) you’re able to side-load applications and IF they work on the Archos firmware, you’ve got yourself a great value little entertainment device. Two more videos coming up soon.